Degree - The degree of the ellipse. Set it to 90° for a circle. Rotation - Rotation of the ellipse minor axis (from the horizontal). 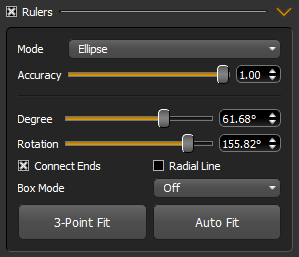 Connect Ends - When accuracy is lower than 1, checking this option will ensure that none of your original input gets mixed in towards the start and end of the ellipse, effectively helping you connect the ends neatly. Radial Line - This enables the radial ruler connecting to the center. When enabled, you can toggle between the ellipse and the radial line by tapping Shift before drawing (this can be changed in the Shortcut settings, via the “Select Line” shortcut). While drawing, you can switch lines by pressing control. Box Mode - When Radial Line and this are turned on and you switch lines while drawing, your pen will be clamped to an elliptical/circular section box defined by the angles and radial length of your first lines. If set to X-Symmetric or Y-Symmetric, the end angle will be determined when you start drawing, depending on which direction around the ellipse/circle you are going. The ellipse center can be moved around by dragging its center point. The size of the ellipse is determined by your pen down position. It is currently not possible to lock the ellipse to a certain size. If you look at the minor and major axis, a portion of them will be orange. This indicates the size of the last drawn ellipse. Use these guides if you need to draw multiple ellipses of the same size at different locations, or disconnected portions of the same ellipse. The Auto Fit button (or associated global shortcut) can help you find good parameters automatically. Simply press the button, then sketch an ellipse (it doesn't have to be complete), and LNP will try to find the best parameters that fit your sketch! You can then fine-tune via the interactive control points. You can activate the interactive control points by holding the control key. You'll notice that the center point becomes yellow. In this mode, it slides along the minor or major axis. Hold shift while using the rotation handle to clamp to 5° increments. When the Box Mode parameter is active, the active span limits will be shown in orange on the ellipse and radial line. dn - Normalized distance around the circle/ellipse. This can be used to sync patterns that need to repeat exactly when going around more than once. ew - The current ellipse width. This can be used to modulate pattern sizes based on the size of the ellipse you are drawing. The width is always greater or equal to the height. eh - The current ellipse height. er - The current ellipse rotation. eca - The current angle of your pen position. See the Circular Patterns and Isometric Circle Patterns script modes for examples on how to use these. The Misc - Gears preset uses the circular square wave mode to create perfect gear shapes.